← Are you a Google fan? I am a huge fan of bookmarklets. I have a folder full of bookmarklets for various web services like Evernote, HootSuite, Twitter, GMail this, etc. I just came across one bookmarklet and probably the only bookmarklet I’ll ever need! 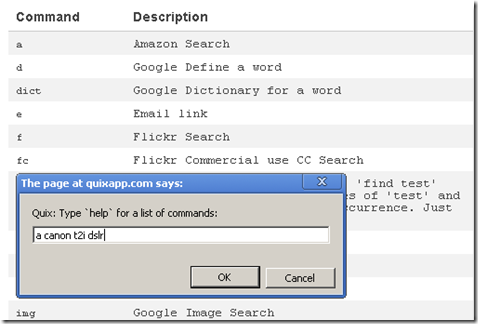 Quix is a bookmarklet that gives you one place to store all your bookmarks and bookmarklets. If you use Firefox Ubiquity or Launchy, you will draw some parallels here. Once you install Quix bookmarklet to your browser bookmarks bar, just click on it. You will get a box to type in commands. 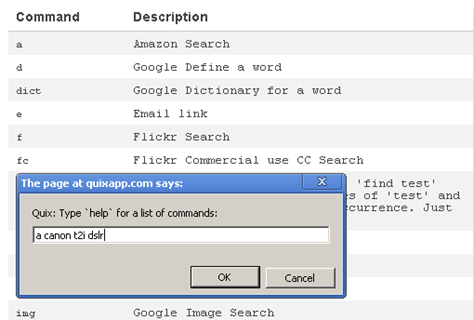 Quix comes built-in with bunch of commands for common web tasks. For eg. you just type ‘gs shankrila.com’ to do a Google Search on shankrila.com. The basic command set includes Amazon search, various Google searches like dictionary, maps, images, Netflix search, Wikipedia, Wolfram Alpha, etc. Social commands – Delicious bookmarks, facebook share, LinkedIn share, Tweet current page, Twitter search, Youtube search, tumblr, Posterous, Stumbleupon, etc. SEO commands – archive, DMOZ, Google Blog Search, Google cache, Google webmaster tools, header info, keyword density tool, linkcheck tool, etc. Webmaster commands – csstoggle, firebug, host info, current ip, ruler, speed, view source, whois, XRAY, etc. You can see the full list of Quix commands here. As you can see the usefulness of Quix is just mind boggling. And if this made you wow, folks who like to get down and dirty with a little bit of coding are gonna love this. Quix is extensible! It means you can write your own commands for apps/services you use. Learn how. Quix lets you store your extensions in a simple plain text file. Just put your quix.txt file in a Dropbox folder and you have a bookmarklet that’s synced across all your computers! For eg. if you would like to use advanced search options in any of the sites like Google, Flickr, Twitter to get results you want, you can follow this tip in TUAW to do so easily. Quix is going to be my new found love for productivity and getting around the web like a ninja! How about you? If you are not still convinced, check out this quick 2-minute video.